Come to the Santa Cruz County Fair on Wednesday September 12, 2012 for Kid’s Day. The Fair opens at noon and kids under 11 get in free. From livestock to a hypnotist, fairgoers of all ages will have a blast at the Fair. Children and their families will be able to participate in the Education Day demonstrations at Yesterday’s Farm and Mr. Magorium’s Exploratorium starting at 9 am. Yesterday’s Farm is produced by the Agricultural History Project, and volunteers help show how farms were once run. Kids can learn how to make wheat flour, milk a cow, ride a hay wagon, and see how to spin yarn. This year Yesterday’s Farm will feature the restored railroad caboose, as well as a Hops exhibit, bringing to life how this important ingredient in beer was once grown here in the Pajaro Valley. Tractors and other farm equipment will be on display, along with a team of draft horses. The kids’ fun continues with All Alaskan Racing Pigs, Circus Imagination, Balloonacy, the Sea Lion Encounter, Hypnotist Michael Mezmer, and Fables of the West. Kiddieland opens in the Carnival Area at 1:00 pm and Kid’s Night at the Arena begins surprisingly early at 3:00 pm. And finally, Pee Wee Livestock Showmanship takes place in the Main Horseshow Arena at 5:00 pm. New attractions to the Fair that kids will love include Walk on Water Bubble Fun, Miniature Golf, and Gold Panning. Nighttime entertainment is set for the Amphitheatre Stage at 7:30 pm as KTOM presents The Lost Trailers. This country band from Alexandria, Virginia, has travelled across the nation with other country acts and has already had several Top 20 hits on country radio. The Lost Trailers’ performance on Wednesday night will light up the stage. The Santa Cruz County Fair is on now through Sunday at the Fairgrounds in Watsonville. The Fair runs from Noon to 11:00 pm Wednesday through Friday, and opens at 10:00 am Saturday and Sunday. Admission at the gate is $10 for adults, $5 for children, and $6 for seniors. Parking is $5 at the Fairgrounds. 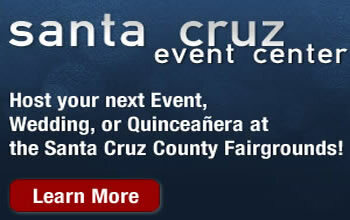 More information and schedules can be found at santacruzcountyfair.com.